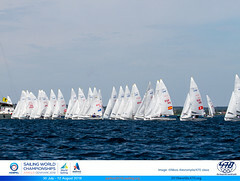 The second day of racing in the 2012 470 Junior World Championship, sailed out of Takapuna Boating Club, is over for the day. 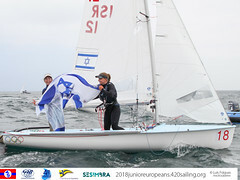 The breeze was up but the junior crews handled it well with close racing throughout the single fleet, but the Italian men's crew Simon Sivitz Kosuta/Jas Farneti dominated results. Sivitz Kosuta/Farneti added another two winning races to their score today in conditions which seemed to suit them very well. "We worked the right after seeing it was better before the start. Wind was similar direction to yesterday. We have good speed and are really enjoying the Mackay charter boat," commented Sivitz Kosuta. From early morning the Waitemata Harbour was covered in whitecaps, and gusts of up to 20 knots came across the race course which was set between Rangitoto Island and the shore. No sun broke through the leaden sky, the breeze built increasingly through the day and continued its shifty and cool blow from the south. Anticipating the shifts is always a challenge and today second placed crew James Turner/Finn Drummond of New Zealand "took our chances and had some great comebacks." A pair of third placings puts them five points behind the leaders. 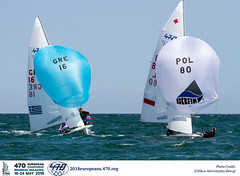 Dirk Bennen/Rogier Weijers of the Netherlands are placed third and though race four wasn't one their best, the dropped score came in and put them ahead of early race leaders, the Matthew and Robert Crawford of Australia, on count back. Afrodite Kyranakou/Jeske Kisters of the Netherlands hold onto their lead with the slimmest of margins after Annika Bochmann/Elisabeth Panuschka of Germany came away with two wins within the women's fleet, and were pleased to have been footing it with the men in the overall standings, commenting "finally we're in the front of the overall fleet, finished 7th overall in the last race. Reaching was tricky, we hoisted later allowing us to lay while others behind had to blow their halyard." British crew Anna Burnet and Flora Stewart are placed third after placing third in both races. The regatta has another five days to go, and with 12 races scheduled followed by a medal race for both the Women's fleet and the Men/Mixed fleet we are still in the early stages of the competition. The forecast for tomorrow is continuing south westerlies of 20-30 knots easing on Monday to 15 knots. Following this the maritime forecast is predicting a change to around to the north, so sailors will get a taste of a range of conditions through the regatta.